A more recent review of 2013 immigration data shows that China replaced India and Mexico as the top country of origin for immigrants to the United States. The 2013 American Community Survey, conducted by the U.S. Census Bureau, recorded 1,201,000 immigrants. Of those, 125,000 came from Mexico, 129,000 came from India, and 147,000 came from China. The previous year, Mexican immigration (125,000) just topped Chinese immigration (124,000). Pew Research has found that Indians constitute four per cent of the total illegal immigrants living in the US, a country where the overall unauthorized immigrant population has remained unchanged since 2009. Mexicans still make up about half of all unauthorized immigrants (52%), though their numbers have been declining in recent years. There were 5.9 million Mexican unauthorized immigrants living in the U.S. in 2012, down from 6.4 million in 2009, according to Pew Research Center estimates. Ranking second to Mexico is El Salvador (675,000 in 2012), followed by Guatemala (525,000), India (450,000), Honduras (350,000), China (300,000) and the Philippines (200,000). But largely because of a marked decline in Mexican unauthorized immigrants since 2009, the shares of unauthorized immigrants from other nations and regions have grown. The sudden reversal of a long trend of growth in the number of Mexican unauthorized immigrants probably results from both a marked decline in new arrivals and an increase in departures to Mexico. Among the states in America, Indians make up the largest undocumented immigrant group in New Hampshire. While the Indian illegal immigrants comprise second largest population in Indiana with four per cent, the percentages in other states were Michigan (4%), Minnesota (9%), New Jersey (11%), Ohio (11%), Pennsylvania (11%) and Washington (5%), the report said. Indians are the third largest unauthorized immigrants in Alaska (4%), Arizona (2%), Delaware (7%), Illinois (5%), Kansas (5%), Massachusetts (10%), Missouri (9%)and Oregon (2%). 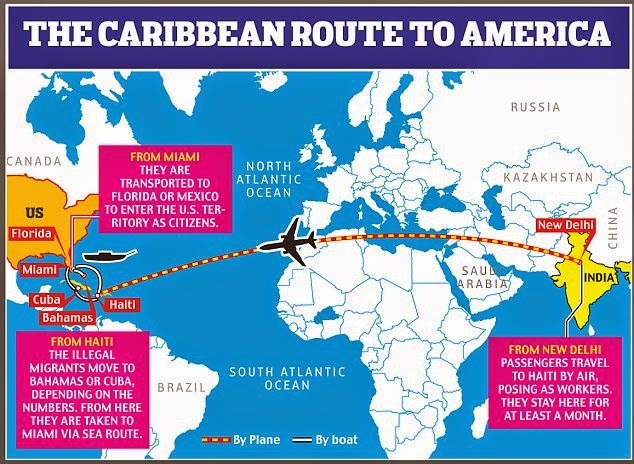 Since the US-Mexico border crackdown on illegal immigration via Arizona and Texas, the Indian human smugglers have changed their trafficking pattern from Guatemala and Mexico land route to Haiti sea route, says a US government report. How to Escape From India? wow ! And we have India being branded in the US as the country which can do no wrong. This can-do-no-wrong approach was perfectly utilized by the Israeli lobby until recently. Even now, no one an criticize that lobby without ruining his/her political career. Same is with India. But I, like most Americans, would have never thought of this ! Thanks a lot for sharing ! Allah, how come BMW is sourcing parts locally for its cars produced in India. Does it mean that the Indian manufacturing is of that high standard. Why are Pakistanis so far behind in quality? If BMW ever makes a car in Porkistan, the only locally sourced part will be a copy of holy quran in the glove box. Hai allah, Porkis are good for masturbation only. Anon: "what has sanitation got to do with the subject of this post?? " Sanitation may not be important to you but most normal human beings, including normal Indians, want to escape filthy conditions in a country that leads the world in open defecation. what is water equity and sanitation equity. Shamim: "what is water equity and sanitation equity." Country rates of change (progression or regression, percent per year) in equity of access to water were compared to the performance frontier (best-in-class performance) to generate a country value for performance in improving water equity. For the 2015 Index we used the gap in rural and urban coverage as our indicator of equity. Values for country performance in improving water equity were calculated for 129 countries. Country rates of change (progression or regression, percent per year) in equity of access to sanitation were compared to the performance frontier (best-in-class performance) to generate a country value for performance in improving sanitation equity. For the 2015 Index we used the gap in rural and urban coverage as our indicator of equity. Values for sanitation equity performance were calculated for 126 countries. Most pray for a child or well being of their loved ones, but in recent years, some unusual temples have come up, including a few that offer divine help in procuring a visa. Lord Balaji is one of the most-worshiped local incarnations of the Hindu Lord Vishnu. His adherents flock to his many temples to pray for things like happiness, prosperity and fertility. Lately, the deity has grown particularly popular at the once-quiet Chilkur Balaji temple here, where he goes by a new nickname: the Visa God. The temple draws 100,000 visitors a week, many of whom come to pray to Lord Balaji for visas to travel or move to the U.S. and other Western countries. Mohanty Dolagobinda is one of the Visa God's believers. Three years ago, a U.S. consulting company applied for a visa on his behalf. It was rejected. When the company tried again the following year, Mr. Dolagobinda's friends told him to visit the Chilkur Balaji temple ahead of his interview at the U.S. consulate. Weeks later, he sailed through the interview. "I've never heard of anyone who's gone to the temple whose visa got rejected," says Mr. Dolagobinda. In the late 1990s, this small temple on the outskirts of Hyderabad -- the capital of the southern state of Andhra Pradesh -- drew just two or three visitors a week. C.S. Gopala Krishna, the 63-year-old head priest of the Chilkur Balaji Temple, wanted more people to come. So he gave Lord Balaji a new identity. "I named him the Visa God," he says. Now, Mr. Gopala Krishna's temple is a hot spot. Billboards on the dirt road to the temple advertise English-language schools and visa advisers. Next to the parking lot, vendors hawk souvenirs and fruit. The Visa God's growing celebrity reflects the rising frustration of educated Indians hoping to move West. In recent years, it's become harder to win the employer-sponsored "H-1B" visas that let skilled professionals like engineers work in the U.S. While the U.S. limits the number of H-1Bs granted each year to 65,000, the demand for visas keeps rising. For the fiscal year ended September 2004, it took 11 months for the U.S. government to receive 65,000 applications for H-1B visas; last fiscal year, it took two months. This fiscal year, the U.S. government received more than 65,000 applications in one day. Applications are now assigned a random number, and the first 90,000 to 110,000 are processed and accepted or rejected until the quota is reached. India Is the Fastest-Growing Source of New Illegal Immigrants to the U.S.
a growing number of Indians that are less-skilled and staying in the country illegally. In fact, in recent years the net number of Indians staying in America illegally has been growing much more than even the number of new illegal Mexico-born immigrants in the country, a recent Pew Research Center report showed this week. Of course the total number of unauthorized Mexicans in the United States is more than ten times higher than the number of Indians but most of them arrived more than a decade ago. The total for illegal immigrants born in Mexico has been shrinking while the total from India has been growing more than any other country. In the period between 2009 and 2014, Pew estimates, the number of unauthorized Indian immigrants in the U.S. surged by 43% to a total of around 500,000. During the same period, the number of unauthorized Mexicans fell 8% to 5.85 million. India now ranks fourth after Mexico, El Salvador and Guatemala in terms of the countries that are the largest source of unauthorized migrants to America. Despite concerns of the U.S. presidential candidate Donald Trump and his followers that a flood of illegal immigrants are hurting America, the number of illegals has actually been falling for years. However the steady decline of the number of illegal immigrants from Latin America has been partly offset by those arriving from Asia, led by India. “The U.S. unauthorized immigrant population – 11.1 million in 2014 – has stabilized since the end of the Great Recession, as the number from Mexico declined but the total from other regions of the world increased,” the report said. If you combine legal and illegal arrivals, both India and China are each sending more people to the United States in recent years. In 2014 about 136,000 people came to the U.S. from India, about 128,000 from China and about 123,000 from Mexico, census figures show. As recently as 2005, Mexico sent more than 10 times as many people to the U.S. as China, and more than six times as many as India. A disturbing video of a man making racist slurs over an apparent parking dispute in Abbotsford is circling social media. It shows a Caucasian male shouting and behaving aggressively at the individual, a South Asian man, filming the incident. The aggressive man got back into a pick-up truck, but then he decided to confront the man again, this time for filming him. When the man asked him when he came to Canada, he replied: “I was born in Canada”. He was also repeatedly caught calling the man a “f*cking sh*t skin” before and after he got back into the passenger side of the truck, even as they were driving out of the area. Sergeant Judy Bird with the Abbotsford Police Department (APD) told Daily Hive the incident occurred on Friday at approximately 6:30 pm in the downtown area of Abbotsford. Prior to being filmed, the truck was parked in a reserved parking spot and in the process of receiving a ticket from a bylaw enforcement officer. Bird says all parties involved in the incident, including the man who yelled slurs, have been identified. APD’s next steps on Monday will consist of making contact with the bylaw enforcement officer, getting a statement from the man who filmed the video, and exploring whether the aggressive man could face charges for the incident. An Indian man who had reportedly travelled over 10,000kms across 11 countries in a month to enter the US illegally in 2016 has been deported back after he was caught staying illegally. The man, identified as one Harpreet Singh, hails from Punjab's Kapurthala district and was deported back to India on Saturday night on a United Airlines flight. Here's more about Singh's 'remarkable' journey. On 20th August 2016, Harpreet Singh took a flight from the Indira Gandhi International Airport to Brazil on a valid passport. From Bolivia, Singh arrived in Lima, Peru. From there, he reached Costa Rica passing through Ecuador, Columbia and Panama. Then, he entered Honduras and went to Guatemala and finally arrived in Mexico, the officer said. The final leg of Singh's journey began in Mexico, from where he illegally took a boat into the US. But why take all this trouble? According to deputy commissioner of police (IGI Airport), Singh's original passport and belongings were stolen by local miscreants at some point during his journey. Singh had then approached his agent in India, who managed to get Singh a fake passport. Singh identified his agent as one Rana - a resident of Jalandhar in Punjab. Police officials said that Singh had confessed that he had sneaked into the US illegally as he wanted US citizenship. After reaching the US, Singh managed to work for 15 months at a departmental store in Louisiana before he was apprehended and deported for illegally staying in the US. Several cases of cheating and forgery have been registered against him in India.